A view of Kelli Rae Adams’s “Breaking Even” on display at the Perry and Marty Granoff Center for the Creative Arts at Brown University. Having read a bit about Kelli Rae Adams’s show “Breaking Even,” I approached the installation gamely, thoughts clickety-clacking in my head about Adams’s concept: How labor, materials, and measures of value inform production and exchange in an artistic economy. My thoughts stilled the moment I stepped into the Cohen Gallery at the Perry and Marty Granoff Center for the Creative Arts at Brown University, where curator Ian Alden Russell has put the show together. The three works there, in concert, have such visual magnetism it doesn’t matter what they’re about. 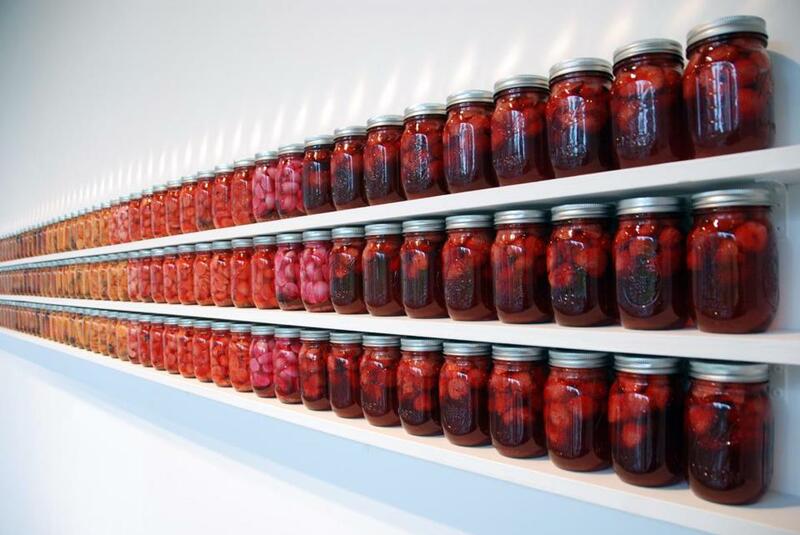 On the wall, Adams has set 300 jars of preserves on three long shelves, organized according to palette, from green pickles and asparagus to carrots to the sweet, deep red of strawberries. On the floor, a wending, serpentine curve of toppled, oversized clay dominoes. To one side, clay silver dollars stacked like poker chips, surrounding great jars of cloudy water. Adams’s conceptual underpinnings drive that. She’s not wasteful. Her unbaked porcelain can be recycled simply by adding water. Hence the water jars amid the currency — there’s already clay rehydrating in them. Some of the hollow dominoes have broken into shards; surely she will reuse that material, as well. The preserves may shine on their perches like dark gems, but they could also feed a person for several months. The dominoes represent the artist’s product. The food stands in for the energy it takes to make the art. The coins are the funds. We expect art objects to last; these won’t. That transience makes the work seem all the more noble and heightens our awareness of the artist’s labor. But the concept here is so elegantly expressed there’s no need to think about it. It’s enough to just be in the gallery; the art says more than words and meanings ever will. 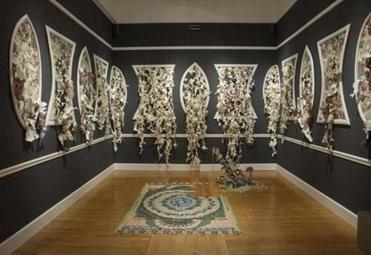 Juried shows, which often have no themes, can be hit or miss, but “Ellipses: Alumni Works in 3D” at the Massachusetts College of Art and Design makes promises with an impressive roster of artists, including crafty installation artist Abigail Anne Newbold, whose solo show at the Currier Museum of Art closes this month, and sculptor Sally Moore. Jurors Dan Dailey, founder of Mass-Art’s glass program, Emily Zilber, curator of contemporary decorative arts at the Museum of Fine Arts, and Chris Rifkin, founding chair of Craftboston, had a particularly rich pool of talent from which to choose. With those jurors, as you might expect, a lot of the work falls in the realm of craft, but most of it is more conceptual than functional. A handful of works are easy to gloss over, but there are several humdingers. Elizabeth Alexander recast a small gallery as a Victorian parlor for her startling, ornate, and creepy cut-paper installation, “Keeping Up Appearances.” White moldings run against the deep gray wall. Frames enclose floral wallpaper, which Alexander has cut into ribbons that spill and curl and explode into the viewer’s space. A Persian-style carpet, also paper cut up into patterns, lies beneath a fallen chandelier, likewise made of paper, which I took at first for a beastly plant. It’s a massive piece, a delicately crafted horror show. Elizabeth Alexander’s “Keeping Up Appearances” at the Massachusetts College of Art and Design. Nearby, with equal chills and fragility, hangs Caterina Urrata’s “Swing,” made entirely of glass, from chains to seat, with glass flowers sprouting along the floor beneath (Urrata graduated just last year). Keith Cerone tunes into texture with “Façade,” setting a square of white, kiln-cast glass, all bumpy and nubbly, against an equally roughed-up backing of burnt pine. Greene adds a slot down the middle with red neon in it, bright as fire. Alia Pialtos’s ceramic “Hone” could be a creature at the bottom of the sea. A round conglomeration of small spheres, it opens to an interior of spikes stuck to those spheres, each leaking a toxic-looking blue foam. Newbold’s odd, clever “High Life” offers a selection of strange accouterments: a surfboard outfitted with leather; a wetsuit sporting leather and fur, and more, asking us to imagine the person, or society, that would make use of such things. Moore’s “Reach” another of her freaky, small-scale narrative sculptures, is frighteningly precarious in the way she patches one shard of wood to the next, extending to a tiny, naked tree at the very end. The oldest alum with work on view here is Stell Shevis, class of 1937, which would put her well into her 90s. Her enamel “Blue Rooster” is a spirited fellow, with legs splayed and ravishing blue-green wings spread. This and works such as Sean Riley’s “Eulogy,” a quilt made of his grandfather’s clothing, and Evan Voelbel’s dark, elegant glass shell, “Mytilus Edulis (Blue Mussel),” remind us that you don’t need high concept or edge to be lovely. 621 Huntington Ave., through July 15.